First the facts: Canada is a settler state located in the northern portion of Turtle Island, formed out of two European colonies established here in the seventeenth century, one by Great Britain and one by France. These colonies were established on the basis of the Doctrine Of Discovery--an outgrowth of the European decision to disassemble the original Peoples of Turtle Island as both individual human beings and as collections of human beings living together in societies governed by the rule of law--and to re-construct these erased people and Peoples as a monolithic dependent population known thenceforth as "Indians," "Natives," and "Aborigines," in need of civilizing. Modern Canadians will say: "What do the actions of my ancestors in the seventeenth century have to do with me today?" Modern indigenous people and Peoples are living trapped inside nations based on the Doctrine of Discovery--a legal doctrine now routinely overturned whenever it comes to trial in the international arena--leading tortured lives as "Indians," "Natives" and "Aborigines." This, while modern Canadians and modern euro-ancestry citizens of every other nation on Turtle Island and in other places around the globe--Australia and New Zealand, for instance--enjoy among the highest standards of living in the world. If this was not the case, then one could respond: "Why, nothing at all." This brings us to the Haldimand Tract in southern Ontario, running from the Grand River's mouth on the northern shore of Lake Erie in a 12-mile wide swath up the Grand River to its headwater basin. In current mainstream discourse, the Six Nations land dispute is framed in the context of "Indian land claims." Reports mention up to 29 separate claims being made by Six Nations against the Crown's assertion of title. The federal government of Canada and the provincial government of Ontario are establishing a panel to settle these "Indian land claims." The reality, obscured by three unrelenting centuries of the European invention of "Indians," is that--at least in law--it is the federal and provincial governments of Canada who are trying to make a claim to land, a claim based on the Doctrine of Discovery. The same objection raised at the Henco development site by Six Nations people can be legally raised by various indigenous Peoples, throughout the entire territory currently called Canada. Instead of a panel whose every chair is occupied by a federal or provincial representative, either pale-faced or brown, seeking resolution to "Indian land claims," there should be a panel of non-European, non-Canadian adjudicators seeking resolution to "Canadian land claims." A panel made up of well-respected international figures like Rigoberta Menchu from Guatemala, Arundahti Roy from India, Linda Smith from New Zealand, and so on across Africa and Asia, would be able to listen to Canada's claims with an open mind and a willing heart. It's not a question of whether the indigenous Peoples of Turtle Island want to share the land with settler populations from around the globe. If that were the case, then there would be no settler nations present on Turtle Island, just as there are no settler nations present in China. The seventeenth century European decision to manufacture "Indians" was based on the European observations of the sixteenth century: The people and Peoples of Turtle Island, while fierce in protection of their way of life, were committed to rule-of-law societies rather than rule-of-force societies, held sharing as a core value and eschewed murder as a dispute resolution mechanism. At Six Nations we see the outline of this older form of society still intact in spite of three centuries of investment first by European and now by Canadian interests into the complete elimination of this distinct society. Twice, European colonial forces attempted a total eradication of Six Nations Peoples, at one point reducing the Six Nations Confederacy population to one per cent of its former count. To the Western World's surprise, a delegation from Kanawake arrived at the doorsteps of the newly formed League of Nations in 1924, asking for admittance to the organization modeled on the Six Nations Confederacy. Canada's response was to send an armed force of RCMP to Kanawake to arrest the Longhouse leaders, impose an Indian Act-recognized Chief and Council system, and amend the Indian Act to make it illegal for Indian Bands to hire Canadian lawyers to defend their interest in Canadian or other courts. Astonishingly, in 2006, the Six Nations Confederacy still exists. 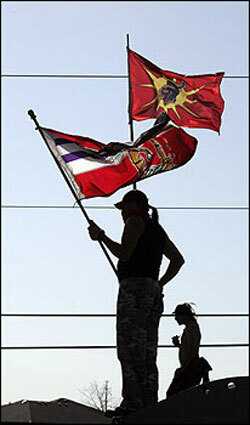 The people have their language, their constitution--in English called the Great Law of Peace--their original peaceful co-existence agreement with Europeans, the Two Row Wampum Belt agreement, an understanding of their territorial boundaries and of their way of life based on a Clan Mother system that recognizes women as the title-holders of the land, protecting it for the "faces to come" who are the true owners. The Six Nations Confederacy call themselves the Eastern Door People. They are strategically located on the entrance to the northern portion of Turtle Island. Passing through their territory, one can travel to the geographical centre of Turtle Island by water. Montreal, Toronto, Hamilton, Boston and New York are all located on Six Nations Confederacy lands. The Six Nations Confederacy was part of the way through a unification process using the Great Law of Peace, which is not only the basis of first, the League of Nations and now, the United Nations, but also of modern democracy. The colonial experience is just a hiccup in this unification process. It's possible that, in spite of several hundred years of genocide, the Six Nations may wish to extend an invitation to Canada to join in unity under the Great Law of Peace. Canada could become a nation in law, could even possibly become a nation of peace. Modern Canadians could possibly enter into a new relationship with the original human inhabitants of the northern portion of Turtle Island, a relationship that the original Peoples have been patiently waiting for, for hundreds of years. Lastly, the facts: The Six Nations Confederacy cannot be eradicated by any means. The offer to join them under the Great Law of Peace will probably remain on the table. Canadians can accept the offer now, or continue with their attempted eradication for another unknown amount of time. As a modern Canadian, what would you like to choose?